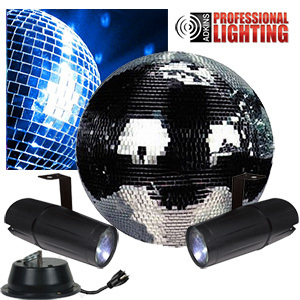 This kit contains everything you need to create dazzling mirror ball effects. 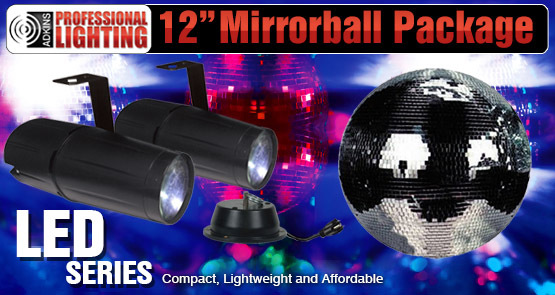 It comes with an 12” glass-tiled mirror ball, motor and two LED spot lights with adjustable mounting brackets. Installs in minutes and is great for house parties, mobile DJs and permanent club installations. 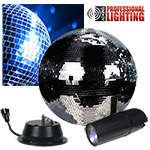 Our best value in mirror ball kits. 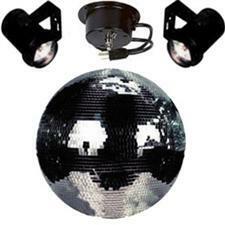 12" Glass Tiled Mirror Ball, Powered Motor (2) LED Pinspots with Adjustable Mounting Bracket.